Well, it had to happen. Everybody’s favorite/least favorite Anon/talking head/fameball Barrett Brown once again drew the attention of law enforcement. Being a very 21st Century character, he was half-naked, seemingly baked, and on video when it all went down. Full report will be up tomorrow on the Daily Dot. You’re welcome. EDIT: it’s up now. 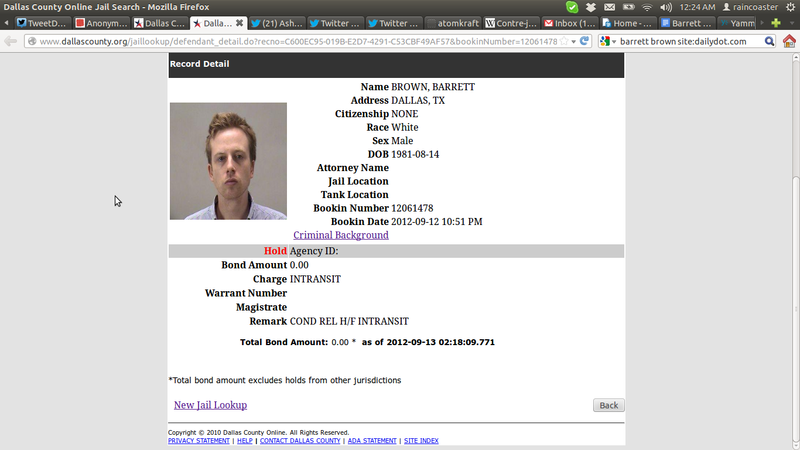 Barrett Brown Anonymous hacker, arested. This entry was posted in Anonymous, Barrett Brown, hacking, news, Police, raincoaster media group, Social Media, webcam, Weird, YouTube. Bookmark the permalink.